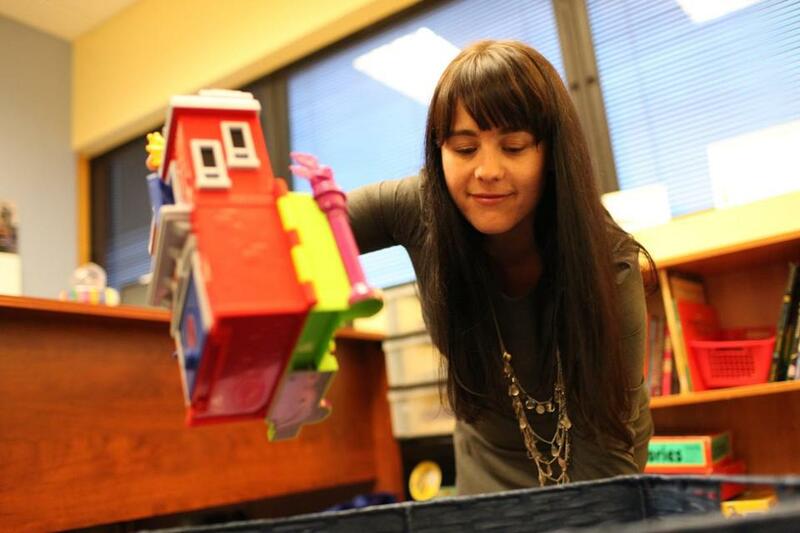 Therapist Kristen Homan, a social worker with Pediatric Health Care Associates in Peabody, puts away toys and games after a session with a 9-year-old child. Children who go to a Wellesley pediatrician can, if needed, see a psychologist in a nearby exam room. At a medical office in Peabody, boys and girls with anxiety issues can simply go upstairs to see a social worker. And at a Newton pediatric clinic, children with attention-deficit hyperactivity disorder are able to see an on-site nurse practitioner specializing in mental health. These are among a growing number of Massachusetts pediatric practices that are sharing space with mental health professionals, a move aimed at improving access to hard-to-obtain psychological services and at sending the message that treating children’s depression and behavioral issues is as important as following their asthma and diabetes. This model is one example of a national trend toward more coordinated services, which centers on primary care doctors working closely with specialists to keep patients healthier and, ideally, to lower overall costs. Getting different clinicians in the same space is not practical in every case, but many pediatricians believe it is the best way to address children’s behavioral, emotional, and mental disorders, which are being diagnosed at far higher rates than ever before. The percentage of children under age 18 who have exhibited behaviors that indicate a serious mental problem has remained roughly 1 in 10 during the past 20 years. But federal statistics show many more of these children are now being identified and treated — roughly 50 percent today, compared with only about 10 percent two decades ago. Perrin said she became drawn to this concept while attending a medical conference about 15 years ago that examined adult primary care practices “co-locating” mental health professionals. She said the arrangement — then rarely seen in pediatric offices — helped doctors and therapists better communicate and helped patients receive treatment in a convenient setting that many saw as less stigmatizing. Given the important role that pediatricians play in a child’s life, they are at the center of many initiatives designed to boost mental health services for the young. The Massachusetts Child Psychiatry Access Project provides a hotline for pediatricians to call for consultations with psychiatrists, especially for help with the complexities of prescribing psychotropic drugs. Started about a decade ago, this program has been replicated in other states. In addition, the Massachusetts School of Professional Psychology offers pediatricians a referral service for mental health clinicians, which has made roughly 1,000 referrals a year. And starting five years ago, pediatricians who accept MassHealth, the state’s Medicaid program for low-income residents, have been required to use a mental health questionnaire to screen children for emerging problems. In pediatric practices that go so far as to share office space with mental health clinicians, doctors typically team up with full-time or part-time psychologists, social workers, mental health counselors, or nurse practitioners who specialize in mental health. Using psychotherapy and sometimes medications, they deal with common psychological or behavioral issues affecting children, such as anxiety, depression, attention-deficit hyperactivity disorder, autism spectrum disorders, and post-traumatic stress. Acute cases are frequently referred out to child psychiatrists, but, due to the shortage of those specialists, many pediatricians end up playing a role, prescribing stimulants, antidepressants, and other psychiatric medications, if needed, and referring children to psychologists or other practitioners for therapy. The mental health clinicians may be employees of the pediatric practice, or bill separately as independent practitioners, but in all cases, the young patients see them in the same general space and perceive them to be part of a unified practice with pediatricians. “It’s great to be able to communicate with doctors face to face, rather than playing phone tag,” said Kristen Homan, a social worker who works at Pediatric Health Care Associates in Peabody. Some pediatricians like the concept, but see practical constraints. Dr. Andrew Baumel of Framingham Pediatrics said his practice, with about six pediatricians, would become too crowded if it made room for a mental health clinician. Also, some insurance carriers cover almost all pediatric services but pay for limited mental health services by selected providers. Baumel said he would hate to tell patients’ families that the doctors’ visits for throat cultures and check-ups are covered by insurance, but not the psychotherapy offered in the same space. Other pediatricians note that not every mental health clinician is a good match for every patient, requiring outside referrals anyway. Still, many clinicians who work with children say incorporating mental health services within a pediatric practice has profound advantages. Barbara Weinberg, a psychologist who goes to a Wellesley pediatric practice once a week, said children are often more relaxed talking to someone in a familiar setting they have known for years, and the therapist and doctor can easily consult with each other. Lisa Liss, a part-time pediatric nurse practitioner who specializes in mental health issues, is also a convert to this model. In her office within a Newton pediatric practice, she sees youngsters with attention-deficit hyperactivity disorders and anxiety, among other issues, and loves the ability to immediately consult with the pediatrician regarding patients’ other health issues that could be affecting their behaviors — or vice versa. She said there’s something special when a pediatrician’s office can be a place that lessens children’s anxiety or lifts their dark moods. “There’s nothing like a kid who is miserable and then seeing them again and they have a smile on their face,” Liss said.